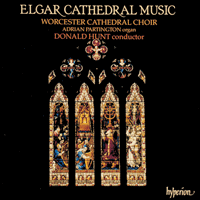 Elgar’s church music is firmly rooted in his Roman Catholicism and in his early years as an organist. Yet, paradoxically, it is also inseparably associated with the great Anglican Cathedral of his native city of Worcester. There he played among the tombs as a child, there he listened awestruck to the anthems and motets, there he played the violin in the orchestra at concerts of the Three Choirs Festival and there he conducted his own mighty choral and orchestral works. Today his statue faces the cathedral and the street where his family lived before they moved out to the village of Broadheath and the cottage in which Elgar was born in 1857. Behind him is the High Street, where his father’s music shop once stood and where you would have found Elgar serving behind the counter, perhaps the day after he had conducted one of his own works somewhere in the city. He was ecumenical long before the word was fashionable, at home in the Anglican and Roman Catholic worlds, but not at ease. This recording contains two of the ceremonial settings of psalms he wrote for first performance in two of the nation’s shrines, Westminster Abbey and St Paul’s Cathedral. But before they are mentioned more fully, we should turn to the acorns from which they grew, the smaller, devout works composed for the choir of St George’s Roman Catholic Church, Sansome Place, Worcester, where Elgar’s father William was organist from 1846 to 1884. Elgar himself was assistant organist from the mid-1870s and succeeded his father in 1885. The religious tensions which are a feature of Elgar’s complex personality may have begun with his father, who was not a Roman Catholic and detested any organized religion. Elgar’s mother was converted to the Catholic faith four years after her marriage and William was never fully reconciled to the idea—he threatened (jocularly, one presumes) to shoot his daughters if he caught them going to confession. Ironically, it was because of the Catholic church’s broadmindedness in employing him as organist at St George’s that all this occurred. Before he started work in his father’s shop, Elgar at the age of fifteen worked for a year in the office of a solicitor, William Allen, a member of the congregation at George’s and a friend of the Elgar family, often visiting them at the Broadheath cottage where he would sing operatic arias to William Elgar’s accompaniment. When Allen died in 1887, Elgar composed a Pie Iesu to be sung by St George’s choir at the funeral, basing part of the melody on a Kyrie he had sketched the year before. In 1902 he rearranged it as Ave verum corpus and Novello’s published it as his Op 2 No 1. The flowing melody in G major is sung by the trebles, each verse being repeated like a litany by the full choir. There is a short coda, with antiphonal effects between trebles and tenors and altos and basses. In its devotional simplicity, it is characteristic of the young Elgar and has kept its place in the choral repertory. Already it shows how he could compose a melody that wraps itself round one’s heart. Typical, too, are the Ave Maria and Ave maris stella which constitute Nos 2 and 3 of Op 2. They were put together from fragments of anthems written for St George’s in 1887. In 1907 Elgar sent them to Novello’s with the admonition: ‘They are tender little plants, so treat them kindly whatever is their fate.’ The Ave Maria in particular has the direct intensity that one finds in Elgar’s larger choral works. On 9 October 1888, the Archbishop of Birmingham visited St George’s to bless a statue. For such an occasion something special was required, so the young organist was asked if he would provide a new work. The result was Ecce sacerdos magnus, virtually the first of Elgar’s ceremonial set-pieces, the forerunner of the music that celebrated great national occasions. Its grand main theme—based on the Benedictus melody in Haydn’s Harmoniemesse—imposing four-part writing and meditative coda point the way forward. Elgar’s three settings of O salutaris hostia are recorded here for the first time. Each has been discreetly edited by Dr Donald Hunt. The first, unaccompanied, was reconstructed by Timothy Hooke from an undated manuscript, possibly as early as 1872, in the British Library’s Elgar collection. The second was published in Tozer’s Complete Benediction Manual in 1898 (but composed some time earlier) and is gentle and devout. The third, published in 1888 in Cary’s Modern Church Music for Catholic Choirs, is more ambitious and recognizably Elgarian, though it dates from 1880. In 1897 the Elgars sent out as their Christmas card Elgar’s part-song Grete Malverne on a Rock, with words by Shapcott Wensley, librettist of The Banner of St George. This was published in 1908 as the carol Lo! Christ the Lord is born. Wensley revised the words. The setting is simple and enchanting. The impetus for its publication came from A J Jaeger (‘Nimrod’) who wrote to his old firm about it from his sickbed. The provincial organist who in 1888 composed an anthem for a bishop’s visit was in 1911 the nation’s musical laureate, at work on two contributions to the Coronation of King George V. One of these was a short anthem, O hearken thou, with words taken from Psalm 5, sung as the Offertory. There are echoes of the falling cadences of the second symphony (first performed in May 1911) in its gentle pages. Elgar heard it rehearsed in Westminster Abbey on 20 June, the day it was announced that he had been appointed to the Order of Merit. This was the pinnacle of success, yet he suddenly decided he would not go to the Coronation itself and forbade his wife to go alone, to her intense chagrin. Echoes of another of his big works composed in 1910, the Violin Concerto, may be heard in the setting of Psalm 48, Great is the Lord which he began in August of that year. Two of its themes are virtually quotations from the concerto’s first movement and finale. He completed it in March 1912 in the version for choir and organ recorded here and it was performed in Westminister Abbey in July at a service to mark the 250th anniversary of the Royal Society. A year later Elgar provided an orchestral accompaniment. It is a large-scale setting, with a straightforward response to the words, including a realistic response to the line about women in labour. The assembly of the kings takes place to a staccato accompaniment. The tonic is D major and it is a surprise when the baritone solo ‘We have thought on thy loving-kindness’ is in the remote key of A flat. The daughters of Judah rejoice in an ingratiating 6/4 before the opening theme returns for the ceremonial conclusion. Two anthems followed in 1914. Give unto the Lord (Psalm 29) was commissioned by Sir George Martin, organist of St Paul’s Cathedral, for the 200th anniversary service of the Festival of the Sons of the Clergy. This was scored for orchestra and organ and its rich Elgarian sequences aptly reflect the psalmist’s rolling periods. At the same time he composed a vigorous harvest anthem, Fear not, O land, for a Novello series for church choirs. I sing the birth was published in 1928, though we have no means of knowing when Elgar composed this setting of Ben Jonson. It has an austere modality, nearer to the Anglican style than any of his early works, and uses three soloists. As always, Elgar found the right tone of voice to convey the sentiments of the text.